Bonni, Bonaire’s epic green sea turtle, is doing just what she heard Ellen Degeneres sing (as the voice of Dory) in Disney’s animated film, Finding Nemo. “Just keep swimming” must be playing non-stop in Bonni’s head, because that is exactly what she has been doing for the past several months. Bonni was outfitted with a transmitter back in September 2018. Bonni became an overnight sensation back in September when researchers from Bonaire’s STCB (Sea Turtle Conservation Bonaire) outfitted a green sea turtle with a satellite transmitter and christened her with the name of Bonni. She had already laid her third nest on Bonaire, which is normally the limit per breeding season. Bonni then went on to return to Bonaire and lay a fourth nest. Bonni swims away from Bonaire but returns again. And again. In other words, she just keeps swimming! After laying her fourth nest on September 21st, Bonni once again swam to the waters around Las Aves (she swam 31.7 nautical miles in less than 24 hours!) and spent three days enjoying the turtle feeding grounds at Isla Aves de Sotavento. However, Ellen was once again singing in her head, and Bonni was off! Just Keep Swimming! On September 25th, she took to the open ocean one more time and set her compass toward Bonaire. STCB is ready to welcome Bonni. With the transmitter sending reports of Bonni’s whereabouts every time she surfaced, STCB was ready and waiting to see what Bonni would do next! On Monday night, October 1st, Bonni was back in the waters around Bonaire and came ashore once again. Bonni laid her fifth nest of the breeding season, which is amazing in that her first nest was already close to hatching. Immediately after laying her fifth nest, Bonni just kept swimming and began another journey toward the east. Where will she end up now? Bonni stops to feed once again in Las Aves. On the evening of October 3rd, another signal was received from Bonni’s transmitter, and she had surfaced once again back in Las Aves. This turtle likes to swim! For five days, she enjoyed some chomping on some sumptuous seagrass and algae and has been back and forth between the islands of Isla Aves de Sotavento and Isla Aves de Barlovento. This archipelago consists of a grand total of twenty-one islets and islands, and, therefore, seems to be a perfect place for our adventurous swimmer Bonni! But Bonni does not stay put. She just keeps swimming! Yet another surprise! 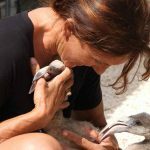 Bonni did not stay in Las Aves, as theorized, but instead, she decided to just keep swimming on her journey eastward to the Los Roques Archipelago – an area rich with coral reefs and seagrasses. Bonni is not the first turtle tracked by STCB to travel to the Los Roques National Park. In 2006, STCB deployed a transmitter on a female hawksbill named Heit. This turtle, who had already been tagged on Bonaire in 2004, traveled to her foraging waters at Los Roques after completing her nesting season on Bonaire. Los Roques, a National Park since 1972, is located just to the east of Las Aves. In 2006, after it became clear that Heit lived in Los Roques, STCB’s Manager Mabel and Field Specialist Funchi went to the archipelago to see if they could spot Heit. And Funchi did see a glimpse of her! In 2008, a diver spotted Heit again on Bonaire. 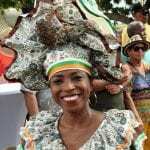 Will Bonni now stay in Los Roques? Guess who’s back on Bonaire! Heading back for another marathon swim, Bonni continues to surprise everyone. Friday evening, October 19th at 10:34 PM, Bonni started her journey from Los Roques to Bonaire. 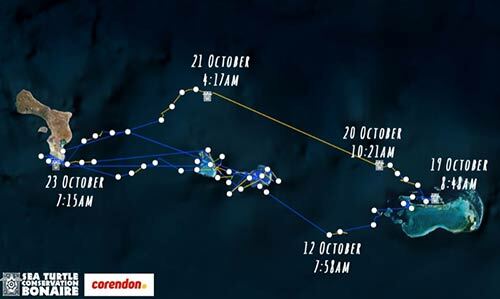 She covered approximately 86 nautical miles/159 kilometers in 56 hours and arrived on Bonaire in the morning of October 22. The yellow lines on the map show where Bonni sped up her swimming; the blue lines, on the other hand, indicate where Bonni swam a little slower. Although STCB has outfitted 26 adult sea turtles with satellite transmitters over the past 15 years, they have not seen migration behavior like Bonni’s before. This proves that valuable data about foraging and breeding habits from each individual sea turtle can be learned when fitted with a transmitter. Laying the inconceivable sixth nest? On the evening of October 23rd, Bonni came ashore once more! She attempted to lay her sixth nest of this season, but, unfortunately, did not succeed. Right after she started digging, Bonni encountered a large rock in the sand, which prevented her from digging any further. She then decided to turn around, and go back to the ocean. When sea turtles attempt to lay a nest, but for some reason are unsuccessful, they may try again either the same or the next night. Although STCB researchers were hoping that Bonni would come ashore again, our Olympic champion had other ideas to just keep swimming. She headed out to open ocean and started swimming eastward again. Bonni has stopped once again in the Los Roques Archipelago and seems to be enjoying her time there in the western islands. 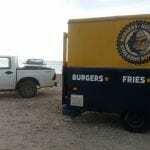 She arrived (for the second time) in Los Roques on October 27th, and has been in that area ever since. Will she stay put? Or will she hear Ellen singing, “Just keep swimming?” Time will tell! Other stories which may interest you.